Sadly, fig season is over, but I remain smitten with jamming. Recently I read an article featuring food blogger Marisa McClellan of Food in Jars. Not only did I learn lots about canning but I was inspired to try her recipes for Pear Vanilla Jam and Pear Cinnamon Jam. 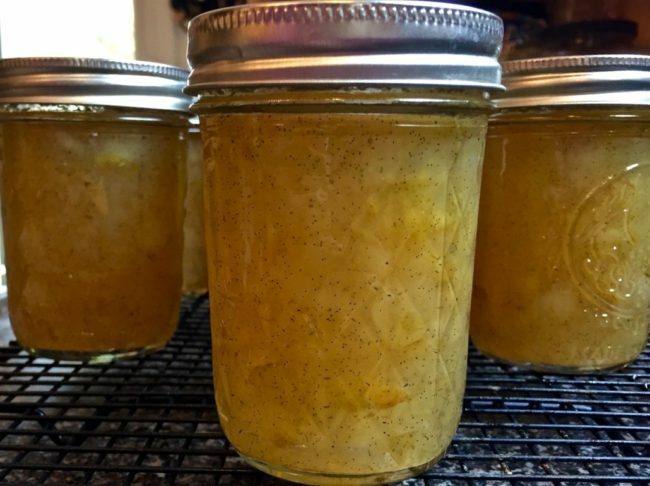 I would love to attend one of Marisa’s canning classes, but Pennsylvania is a tad too far, maybe if Tom and I ever get around to making our Philadelphia trip, I can talk him into adding some time for me to take a class or two. On to the jams! 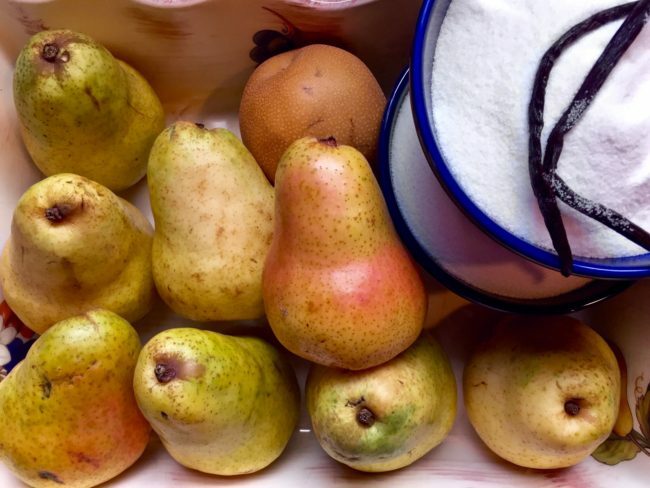 I took a trip to my local market in search of pears and was amazed by all the different varieties, including Anjous, Bartletts, Bosc, Comice, Concorde, Forelle, Red, Asian and something called an Apple Pear. I tracked down the produce guy who said the sweetest pear is the Comice. The very nice produce guy even cut one open for me to try but it didn’t seem all that sweet, and the skin was a tad thick. I eventually decided on the Bartlett pears mainly because they were very ripe and on sale. Each recipe called for 8 cups but I had no idea how many pounds that would be, so I purchased 8 pounds to be safe. Good guess as it turns out it was about 2 cups per pear (but that will vary depending on the size of your pears). The first time I made the vanilla jam, it did not set up. Following Marissa’s instructions, I waited 48 hours to see if it would, but it did not, so I had to reprocess it a few days later. The second time I made it, it took about 15 minutes to achieve the correct jammy consistency. I used the chilled plate method to test for doneness which calls for placing a couple of small plates in the freezer, when you think your jam is close to being done, put a small spoonful on the chilled plate and wait a couple of minutes to see if the surface forms a skin and seems to be getting more solid (be sure your husband doesn’t eat the sample while it cools … Tom, that would be you!). If it does not, continue cooking and checking every couple of minutes. I freeze a couple of plates as it usually isn’t quite ready the first time I check. 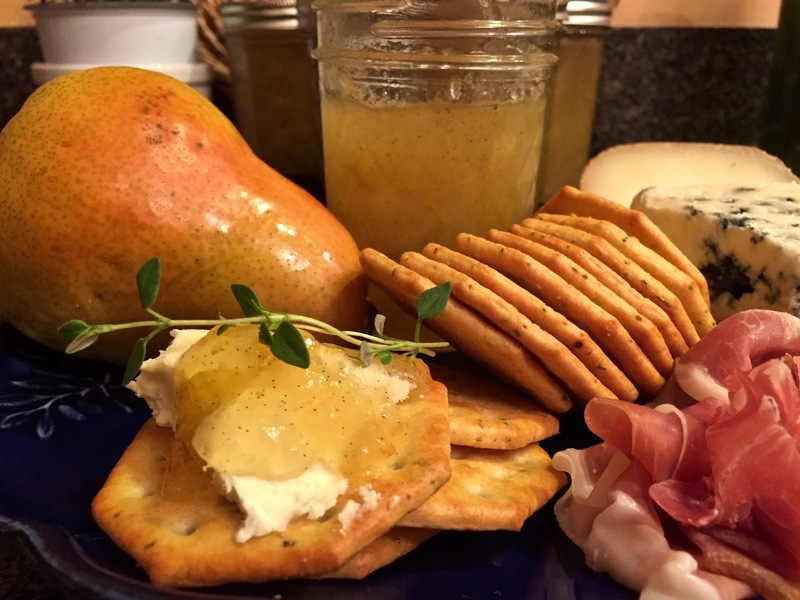 The Pear Vanilla jam is so lovely and delicious, and will definitely be in gift baskets this holiday season along with the Strawberry Grand Marnier Fig Jam I made earlier this year. 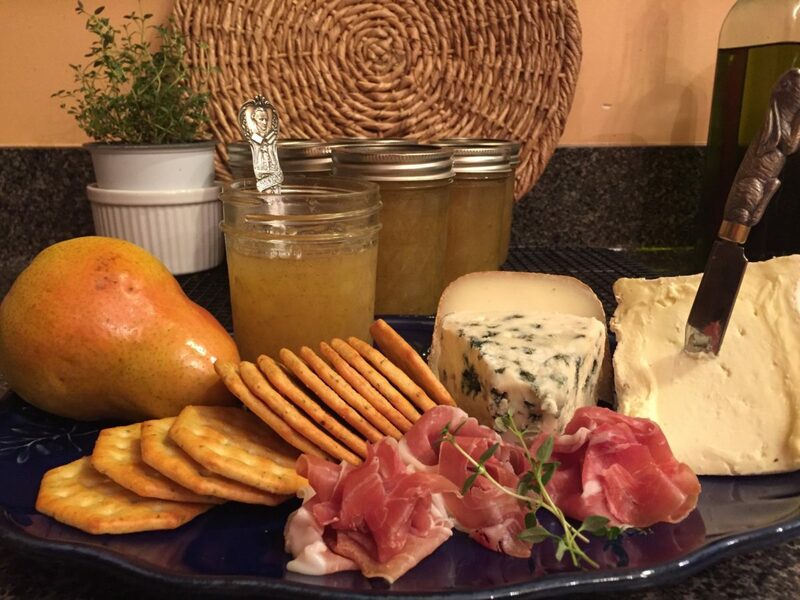 We tried this jam first on a cheese platter. 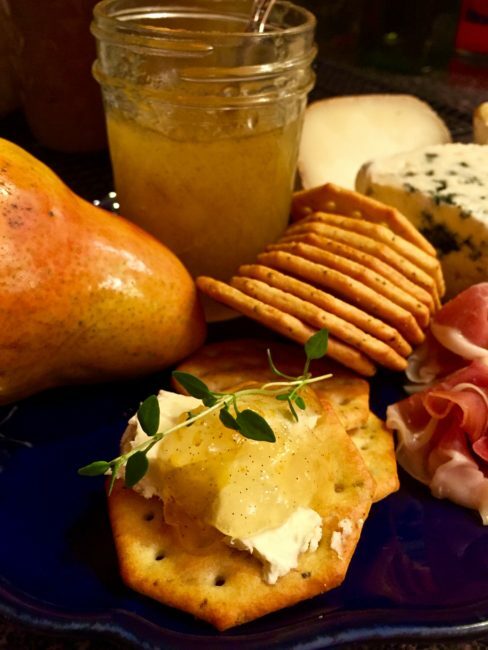 Since we recently returned from a trip to France (check out Tom’s trip France report), I used Delice de Bourgogne which is triple creme yummy excellence together with an incredible Roquefort, an Abbaye de Belloc (semi-hard sheep’s milk cheese), and rosemary crackers for my cheese platter. Yay! I’m absolutely making more of this jam while pears are in season. 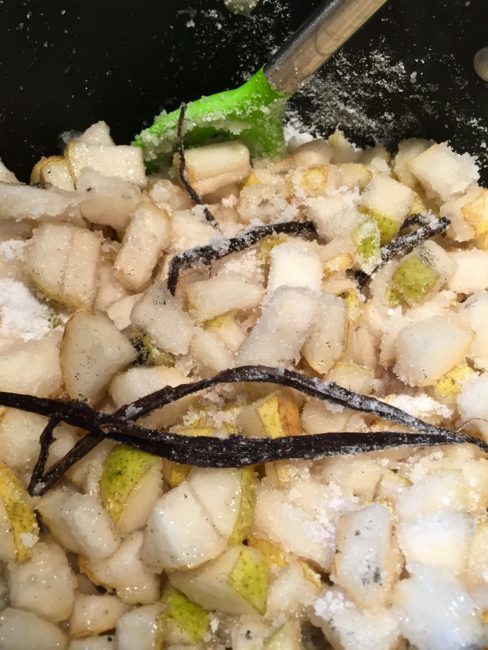 In a large, heavy-bottomed pot, combined chopped pears, sugar, the vanilla bean pod, and everything scraped out. Cook over medium heat until the fruit can be easily smashed with the back of a wooden spoon. Remove the vanilla bean pod and use a potato masher or immersion blender to break the fruit into a mostly smooth sauce. Before jamming, be sure to sterilize your canning jars and bands in a large pot of boiling water. I leave my jars on a low simmer while the jam is cooking so they remain warm. Wash the lids in warm, soapy water, dry and set aside. When the jam is ready, carefully remove the jars from the hot water with tongs. Ladle the jam into the warmed canning jars leaving ¼” space at the top of the jars. Run a knife around the inside of the jars to remove any air bubbles. Wipe jar threads and rims with a clean damp cloth, so they don’t stick shut. Cover with lids; apply screw bands until fingertip tight (don’t over tighten or there is no room for expansion). Process the filled jars in boiling water for 10 minutes (start the timer when the pot has returned to a boil). Carefully remove from water and let cool completely on the counter with a rack or towel underneath. That pinging you hear is a sign of a good seal. However, you still need to check the lids.